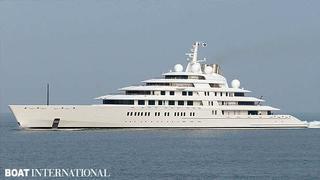 The largest superyacht in the world – Lürssen's 180m Azzam – is undergoing her second round of sea trials in the North Sea. She has been clocked at 26.2 knots so far. Azzam was predicted to reach a top speed of 30 knots, and this was reportedly archived and surpassed during her first set of sea trials in June as she was tracked on AIS as going 31.5 knots. Official performance stats from Lürssen to come. The super-sized superyacht is powered by four engines (two diesels and two gas turbines), linked to water-jets, producing 94,000hp. Pedol cites the angled reverse transom and the sharp bow as his favourite elements of the exterior styling. ‘The bow and stern are both talking about speed,’ he says. The yacht’s performance requirement called for a relatively narrow beam compared to her length – although she is still 20.8m wide. ‘One of the main challenges was the superstructure geometries with the requirements from the structural engineering department,’ Pedol says. Engineer Mubarak Saad al Ahbabi assembled and guided the build team, which in addition to Nauta, included interior designer Christophe Leoni, technical project management by Burgess and technical engineering by Lürssen. Leoni created an interior inspired by early 19th Century French Empire design. A focal point is the open-plan main saloon, which is 29m long and 18m wide.